Life Through Reflections...: Silver Birch, Encore. Many of you might recall my infatuation with a beautiful birch tree, the one that used to adorn my easterly views in my old house. One year I decided to follow the changes of its foliage and document them here in a series of photographs, showing the yearly cycle of that stunning silver tree. Never before have I paid such a close attention to that lovely birch as I did that year and in the process I realized how much beauty and life goes unnoticed every day in our own views. It was with a deep sadness in my heart and tears in my eyes that I watched my neighbours cut down my beautiful friend this past spring... I do not think I can ever accept or understand this atrocity. Thus I was overwhelmed with joy when I realized that a beautiful silver tree adorns the easterly views in my new home. 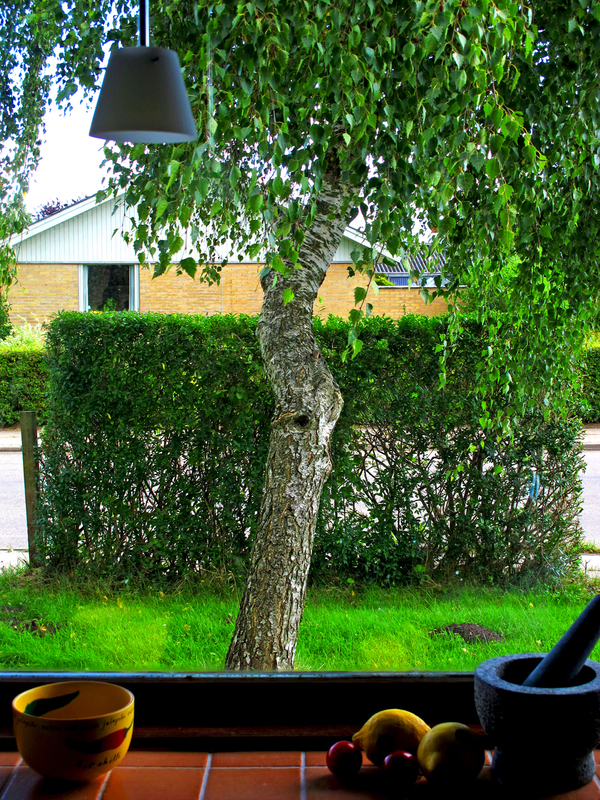 Once again, I can watch a magnificent birch and its transition through the year, as it plays out just outside our kitchen windows. Therefore with renewed enthusiasm have I decided to document its yearly cycle, starting from green to bare. I hope you will join me on this trip through the next few months, as I once in a while share with you the beauty of this natural change, as it gradually commences in my views. Love your tree, Zuzanna. I can relate to those emotions when someone does a thoughtless hacking of a beautiful tree. I am just reading Phantastes by George MacDonald wherein the protagonist is embraced by the dryad of a beech tree. Have you read it? Surreal and lovely book. Thanks for your post. My favourite tree since childhood has been the Lombardy poplar. I loved it for its height and majesty. The silver birch rates highly too. Thanks for this wonderful series of photos that mark its changes. Coming from Australia there's a lot to be said for the humble gum tree in all its many varieties. But the gum tree does not change through the seasons, not like the birch, and there's something joyous about being able to map the seasons. Thanks Zuzana. Just had a strange thought about you, old birch tree and how you two are connected. Look in your mailbox and I'll explain. But I'm glad you have a new birch tree to look at through the seasons. Yes, I remember those posts about your birch! So sad that your neighbors so thoughlessly cut it down. I look forward to the progression of your new birch! cutting down such a tree is a criminal act. i remember when our neighbor cut down her magnolia tree - it stood alone and beautiful in her back yard and was absolutely the perfect shape. we couldn't believe she cut it down. later she admitted that it was the wrong decision, but of course, it was too late. i'm glad you have a new birch tree to ease your pain. I can relate to this.I love maple trees and where we lived when the girls were growing up several families went together and had a tree removal of sorts.Cutting down at least 3 of them.I was upset as well.Seriously I just think sometimes people just feel they need to destroy something.I dont know what else the reason would be.If they are dying or dead thats another story.Oh well lol. I do think Birch trees are lovely. I'm so glad your new home has a birch tree for your enjoyment! I feel a kinship with you because we planted a river birch in our back yard and we can view it from our screened in porch at every season too. It's amazing how quickly they grow. Ours is huge now even taller than the older red maple. We're on our first road trip in our new travel van staying at a campground near Hershey PA. Going to the Hershey RV show on Friday. We just had our coldest night - lows in the 50s. I guess fall is on its way. Don't know much about birch tree but I can say it's nature beauty in action again. Can't understand why people keep cutting trees - I remember the ones we had home when I was a child, they brought so much peace to our garden and life. Now they are all gone and it's sad. Would love to hear about its cycles - we can learn so much from nature. Have a lovely day! Take care. When I was a child I was loving trees and I was touching them,they looks me like very old spirits that live and observe us.They grow together with us and can protect us if we respect them. Beautiful tree,my Mum told me something nice when I was stayinng with her recently.She said my first words were the usual Mummy Daddy and the next word was tree! 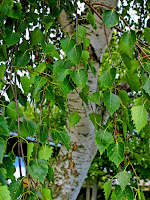 I love birch trees and am a tree lover as well. Then I watched my tree cry being chopped down because the roots were bad for the foundation. To this day I always cry for cut Christmas trees.People don't understand how much they want to live. I am eager to watch the process. Beautiful trees! A Toast to New Life! I'm allergic to birch, but they are such lovely lovely trees. Where I live I'm surrounded by at least a hundred of them! So glad you've found a new tree to watch and be inspired by. You are sensational, Zuzana and I just can't stop admiring your eye for detail. Instead of sitting and moping for the lost tree in your old house, you have again set your fine eye roving. You are someone I have learnt many things and sure will learn many things. Glad that I found you and your blog, Zuzana. 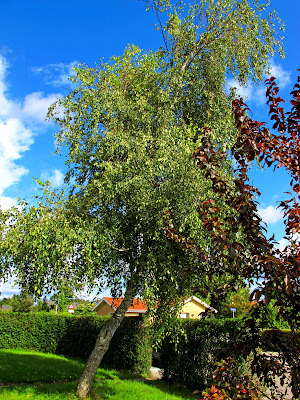 I am so happy that you have a silver birch at your new home, Zuzana! 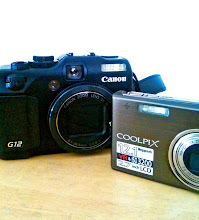 I will enjoy seeing your photographs! Richard, Elisabeth, Elizabeth, sprinkles, Julie, Becky, Sandy, Brian, Marie, Lilybets, Myriam, Angela, Lady, Jill, Micahel, ladyfi, Susan and Zuzu, what a collection of beautiful sentiments when it comes to trees and the way they affect us. It seems that all of you feel the very same about cutting down a healthy tree as a I do - the fact that it is a terrible atrocity to do to a living thing. I am looking forward to share the autumn images of our tree with all of you – thank you so much for all your kind and poignant words. Hurrah for your new silver birch tree! I love trees so much and always have. I used to spend hours at the very top of a tall pine when I was a child, swaying with the breezes on top of the world. When we moved from the home we'd honeymooned and begun our family in, the new people cut down the two maples in the front yard. They weren't very healthy trees, but it still broke my heart. I enjoyed the journal of your old birch tree and am sorry to hear of it's end. I am glad to hear that you still have a beautiful one to watch. I'm looking forward to your posts on it's changes through the seasons. 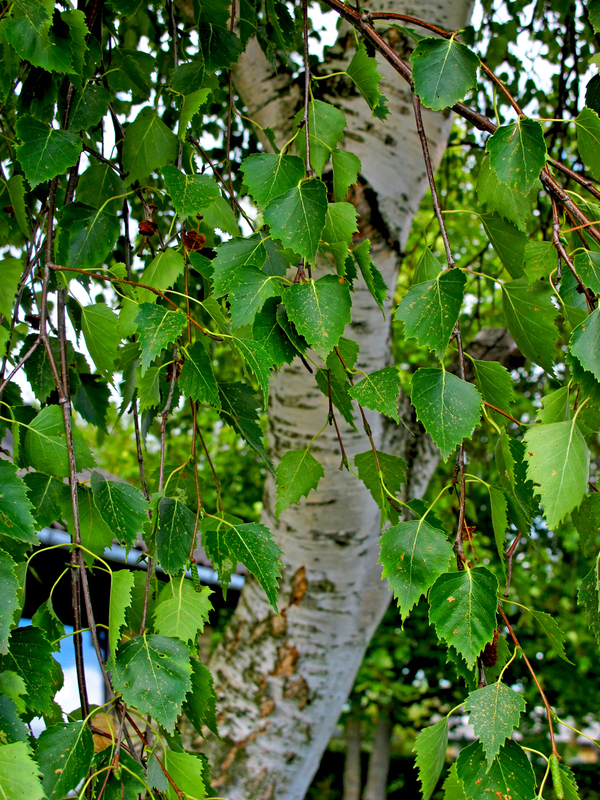 we have so much in common, zuzana ~ i adore birch trees as well - they are so similar to the aspen in colorado. we don't have as many around this part of the midwest so i love looking at your photos. 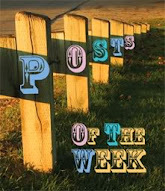 I am looking forward to your posts, I remember the others. As for trees, when we lived in New Mexico we had to fight to get anything to grow. Here in South Carolina, it is another story. We have to keep a close watch for seedlings or they will take over. You can have to much of a good thing. On the other hand, one of our lovely old oaks out front is dying, and there isn't anything we can do to save it, heartbreaking. The unnoticed beauty of everyday life. It's there. Thanks for the reminder! Hi Zuzanna,thanks for the visit today.Yes I do always change my background on my page.Thats my art so to speak on my page.I love actualy designing the page more than blogging itself LOL.I should be a graphic designer when I retire,lol.Im seriously thinking about it. Wonderful observation of seasonal changes of the tree. So glad you have a beautiful tree and will document its progression. Sorry about the other tree. Looking forward to your pictures. Take care, hope you're still enjoying the newness of your new life. Tree is so beautiful . 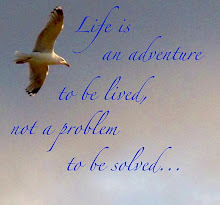 Its a blessing .I am new to your blog and it is lovely . de hojas puntiagudas, muy frecuentes en los bosques europeos. Rosezilla, LadyCat, Amanda, Adrielle, Kat, Sandy, Becky, Rajesh, Myrna, Izdiher (welcome) and Ricardo (welcome) – gosh I am so way behind with my replies to your lovely words. I guess I am living more off line thee days. So glad that you are enjoying my visits with a new birch, soon updates will follow.